Worm composting (vermicomposting) is a composting process in which you feed your food scraps to a specific type of earthworm (red wigglers). Composting worms need moist bedding in order to survive. Almost any carbon source can be used as worm bin bedding, but some worm bedding material works better than others. This article will give you an overview of what worm bin bedding material works best and where to get it. Shredded Paper makes an excellent worm bin bedding. I prefer to use shredded newspaper but any type of shredded paper will work. Avoid the glossy section of the newspaper or the glossy junk mail. Shredded (ripped into strips about 1 inch wide) newspaper has enough bulk that it creates room for airflow and for the worms to wiggle around it but it also does a great job of absorbing and holding in moisture. Another benefit is that you can easily find a free source of paper. You may also have a home paper shredder that you use to dispose of sensitive security information. I take great pleasure in feeding my red worms my paid bills and unwanted credit card offers! Be careful that your shredded paper worm bedding doesn’t matt together in large chunks as this can cause anaerobic (without oxygen) decomposition and a foul odor. To avoid this, simply mix and fluffy the bedding so that it doesn’t stick together. Shredded Corrugated Cardboard is another good source of worm composting bedding. Cardboard is thicker than paper so it takes longer for the worms to process it (eat it and poop it out!). Corrugated cardboard leaves room for air and worm movement because of the space in each piece of cardboard. You can probably find a free source of cardboard (one large box will fill a worm bin). One drawback to using corrugated cardboard as your primary source of worm bin bedding is that it is difficult to shred or tear. You will make your hands sore tearing it up. Dry Dead Leaves can also be used as worm bin bedding. They are free and plentiful (especially in the Fall). One benefit is that they do not need to be shred or torn up. Leaves usually do not hold as much moisture as cardboard or paper so you may need to add water to keep the composting worms at the optimal moisture level. One drawback to using leaves is you will also be adding some other little creatures and bugs that were living in the leaves. This is not a problem for the worms but it may be for you, especially if you keep your worm bin inside. Avoid using magnolia leaves as they are too large and waxy to be used as worm bin bedding. Hay or Straw works well as worm bedding material, however unless you live on a farm, you will need to purchase the hay or straw. another drawback is that hay and straw do not hold moisture as well as paper and cardboard. Hay and straw do provide great space for air and worm movement because of their structure. 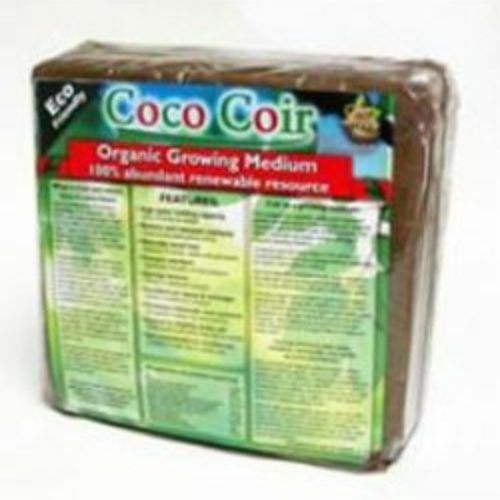 Coir is another option for worm bin bedding. Coir is a natural material that is made from the husk of the coconut shell. You will need to purchase it if you want to use it. It holds moisture very well and is fluffy and nice to work with. You may have received a brick of it with your initial purchase of worms depending on where you ordered from. You can purchase a worm bin refill kit here. Half Finished Pile Compost can also be used as worm farm bedding. If you have an outdoor hot compost pile already then this is another free option. You want to use material from your hot compost pile that is about half way finished. Once it is totally finished it is too much like dirt. Remember, red wiggler composting worms live above the soil and cannot tunnel through dirt like night crawlers can. To use it as worm bin bedding, pull some half finished compost out of your pile, add some water, and add it to your worm composting bin. It will be mostly leaves and therefore will have some extra critters in it. I choose not to use pile compost in my worm bin because I would rather wait for it to finish and then use the hot pile compost in my vegetable garden. Worm composting is a great way to turn a waste product (food scraps) into a nutrient rich plant fertilizer (worm poop!). Composting worms need moist bedding to live in. Think of it as their furniture. Almost any carbon source can be used as worm bin bedding, but some may fit your vermicomposting system better. You will need to add more bedding to your worm bin as your feed and care for your worms. If you found this article useful, please share it with a friend. Thanks, happy worm farming!